New economic challenges make it essential for job seekers to maximize their performance in every interview. Executives recruiters, Gary Capone and Mark Henderson, teach interview techniques that work in their new book. The Power Up Approach to Interview Preparation simplifies the interview prep process into a series of quick, easy and effective steps. The approach was developed by executive recruiters, Gary W. Capone and Mark Henderson, and incorporates powerful techniques proven to be effective. The Power Up Approach will benefit job seekers at all levels, including new graduates just entering the workforce , professionals looking for the next step in their career, transitioning military personnel and seasoned executives. This book will give you the tools you need to sell your potential to an employer, through a series of lessons, each packed full of advice, techniques and exercises. For many professionals, following our approach will give you a distinct advantage over the competition. The Power Up Interview Preparation book offers detailed step-by-step instructions for improving interview skills. The techniques taught in the book were developed to quickly prepare a person to interview effectively. The book begins with several chapters on the basics of interviewing. From there, it dives into specific techniques that to improve an individual's interview performance. Next, the book details strategies for specific types of interviews. Finally, the book concludes other perparation steps necessary before and interview. 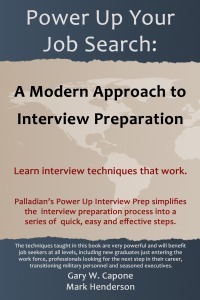 Although the Power Up Interview Prep Approach is designed for seasoned executives, the book provides an initial foundation making the techniques accessible job seekers of all levels. Recent college graduates to top executives will find the approach easy to implement and extremely effective. The core of book are the exercises at the end of each chapter. Each exercise guides the job seeker to complete a short activity that will improve their ability to interview.